The Last section of the A82 to be improved in the area following the opening of the Ballachulish Bridge was the Ballachulish Bypass. This saw a new bridge over the River Laroch and the underpass for the Isles road was the last section to be built, finally opening in 1984, although further works continued into the following year. Whilst the new road had re-routed traffic away from the narrow arches which it formerly had to pass under, and out of the village, one of the arches had to be demolished to make way for the new road. A number of houses were also lost, including Glacantobair which sat at the Glencoe end of the village, just above the shore. The Scottish Development Agency were awarded a Civic Trust Award in 1980 for the work they had done to improve the village and landscape the slate waste bings that had been left behind when the quarry closed. Around a million pounds had been spent, and many thousands of tonnes of slate moved before 40,000 tonnes of top soil were spread over the top. To finish, 80,000 trees were planted in the area. The MP for Argyll was reporting back on a visit to Ballachulish, where the Scottish Development Agency had planted 80,000 trees, as mentioned above. Apparently they had been planted so close together as to cause great amusement amongst the local forestry workers. The reason had been to prevent vandalism, but it is not clear whether this was an urban solution erroneously transferred to Ballachulish, or a genuine concern! Following a poor report on the condition of the school in Onich in 1978, a decision was made to transfer the pupils to the nearby St Brides School in North Ballachulish. As a result, a new extension was added to St Brides to provide a second classroom, with the improved school being ready for the larger roll in time for the new school year in 1980. The old Onich School is now a private home next to the village hall. A further extension was made to provide a third classroom by converting the old school house in 1993. The school has since reduced to just two classes however. The New Ballachulish Visitor Centre was opened in May as part of a substantial plan by the Highlands & Island Development Board to rejuvenate Ballachulish and support the local economy through tourism. The Ballachulish Children’s Home housed at Park House was closed this year. Three years later it was given a new lease of life as the Abbeyfield Home in the village. 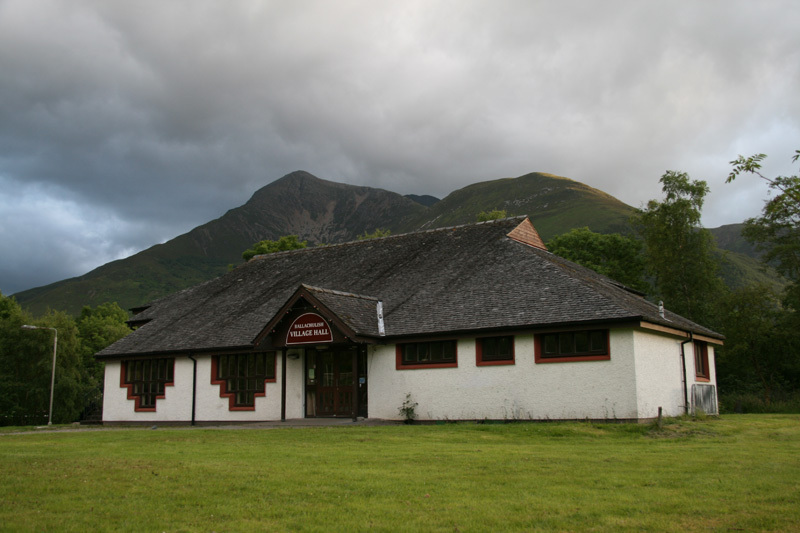 A public meeting saw the formation of a village hall committee tasked with finding a site, securing funding and constructing a new village hall for the community, who had previously been using the old Hall in Ballachulish Square (now the JSMTC) and more recently the old St Johns School Hall. A Week later a bank account was opened with over £1500 already raised by donations. Within the debate reference was made to Ballachulish where there had been confusion regarding the provision of a licence for a Marina development. Apparently the Scottish Devleopment Agency, Highlands & Islands Development Board and local councils had developed a marina and arranged for a company to run it, but the Crown Estates had simultaneously granted a licence to another company. Similar problems had occurred elsewhere on the west coast with Fish Farms. Questions were asked about the construction, financial support and occupation of industrial units provided or financed by the Highlands & Islands Development Board. The answer revealed that 2 units had been completed at North Ballachulish in the previous 18 months, were currently vacant, but had previously been occupied. A question regarding tourism and leisure projects which had received grants from the European Regional Development Fund. Whilst a full list was not forthcoming, projects in the previous 18 months included the Access road to the ‘Tourist Development site’ in Ballachulish, presumably East Pier Road to the Isles of Glencoe, which had received £25,500. Sometime in the mid 1980s the Chisholm family moved their garage business from the old station site to the West Quarry Industrial Estate. This paved the way for further residential development in the area, but also saw the old engine shed slowly fall into disrepair as no further use could be found for the building. The Jubilee Park underwent a range of improvements during 1985. Initial plans show perimeter tree planting around the whole park, additional vehicle accesses opened up from Park Road and other minor works. In the end all that seems to have been carried out was drainage works and the reduction in height of the wall at Park Road to help traffic, as well as the path along Loanfern. It cost nearly £150,000 to build including fixtures and fittings, and thirty years later it is still an important part of the community which is regularly used by local groups and also hosts a number of weddings and other large functions each year. Work starts on Painting the superstructure of the Ballachulish Bridge. This meant that the bridge was reduced to single lane running with traffic lights for 20 weeks. The underside of the bridge was to be painted in 1987, without any disruption to traffic, although the work took longer than expected and so was delayed. The newly completed Village Hall took part in the Highland Council Village Hall Visitor Scheme during the peak summer weeks. It was not a particular success, seeing very few visitors through the doors. Other Halls in the Highlands did, however, receive large numbers of tourists. Despite having been operating with residents for 2 years, it was not until July 1986 that the old Ballachulish Abbeyfield Home was officially opened by Princess Diana’s Mother Frances Shand Kydd. The old Park House stood in the courtyard area of the current Abbeyfield House. In 1986 requests were made for a pavement to be installed in front of the cottages in Loanfern. At the time, it appears that the address for these houses was still East Laroch, as far as the council was concerned, with only numbers 1 and 2 at the back of the square listed as Loanfern. This is in stark contrast to maps dating back to when the houses were first built, where they are named as Lon Fearna. The pavement was never installed. Community Council records show that the Highland Council was considering leasing the East Quarry for grazing in 1987. Nothing seems to have ultimately come of this proposal, but it is quite clear that at the time the Highland Council did not consider the quarry to be the public open space and community asset that it is today. Indeed, requests to have a broken stile replaced with a gate to allow better access for dog walkers, amongst others, were turned down. The Secretary of State for Scotland was asked “how long repair work has been in progress at the Ballachulish Bridge; whether this work was necessitated by a mistake in the original construction; how long the work will take; and what it will cost”. The response was that the work was regular maintenance, including painting, and that it was not due to any deficiency in the bridge design or construction. Work had run from June to December the previous year, before being suspended for the winter and resuming in Late March 1982. The estimated cost was £250k but further painting was scheduled for the following year. The Secretary of State for Scotland was asked about the costs and frequency of regular maintenance of the Ballachulish Bridge, and how it compare to the Kessock and Kylesku Bridges. He replied that the first major outlay had been that for the resurfacing in the previous 3 years, which was equivalent to 5% of the capital cost. A comparison was not forthcoming. After apparently lying empty for a few years, the former district council offices were converted into flats over the winter of 1987 – 88 and so became MacInnes Court. 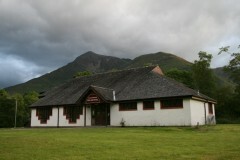 The offices had formerly been home to the registrar for Ballachulish District as well as providing a council point in the village. At a similar time, a new registrar was appointed for the district which at the time was the whole portion of Lochaber formerly in Argyll to the south of Loch Leven, and so included half of Kinlochleven. Great debate was raised by the fact that the new appointee lived on the NORTH or Inverness-shire side of the River in Kinlochleven! The Primary School in Ballachulish was in the news due to a reduction in the school roll to 45, meaning that it was reduced to a 2 teacher school. This compares with the 150 or so between the two schools recorded over a century earlier. Student numbers have recovered somewhat to be around 70 today plus the nursery classes, although a couple of years ago they were high enough to warrant a fourth teacher! Following the construction of the bypass, the houses now known as Lochside Cottages became somewhat separated from the rest of the village. At the time they were still numbered as 70-73 West Laroch, but following requests from the residents they were renamed to avoid confusion and make it easier for visitors to find them. The cottages at Elizabeth Place were built on part of the old railway trackbed in 1989, with Angus Crescent following a few years later on the site of the station platforms. The row of Old Railway Cottages which sit at right angles to Elizabeth Place date from a similar time, with the houses in the old goods yard then following. There are plans to construct a riverside path from the old Brig O’Laroch all the way down to the river mouth on the shore of Loch Leven. Early reports suggest that the land owners along the East Laroch side of the river were largely happy for the project to proceed, but clearly it never did to the full extent, with only the section from Albert Road to the shore being built. 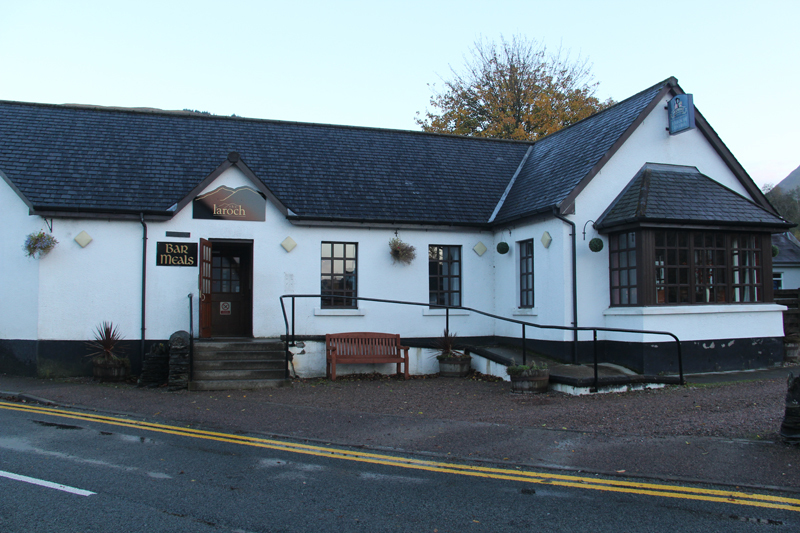 After receiving planning permission in the summer of 1987, work to convert the old chip shop into the Laroch Bar was finally completed in 1991 by the new owner, Alex Russel. 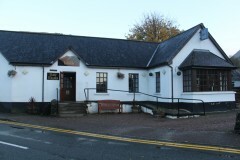 The building had originally been the Village Bakery, but was extended to provide restaurant accommodation. The original letter requesting support from the community by the then owner of Barrs Stores says that Pool Tables, Kareoke and the like have no place in a village pub, in his opinion! This is only the second pub to ever have existed in the village, the earlier one being a ‘Refreshment Rooms’ in Brecklet. The Isles of Glencoe Hotel opened in 1991 with Mystery World, later to become Lochaber Watersports, added a few years later. The hotel was also extended in the late 1990s. The site of the hotel had in the past been used for the village Gala. The Ballachulish Station building re-opened as the village Doctors Surgery, following a sensitive renovation project. Following closure of the line, the building had been used by the Chisholms as part of their garage business for many years. The surgery had previously been housed in part of the Doctors home at Craigleven in West Laroch. Local MP Charles Kennedy asked the Secretary of State for Scotland about applications for development in National Scenic Areas which had been ‘called in’ since 1979/80, and was told that there were 4 such applications, including one for 7 houses on the Ballachulish Foreshore. The long established Ballachulish based Bus Company Gaelic Bus, formerly MacConnachers was sold to Highland Country Buses in Summer 1996, with some of the business possibly having been divested to National Express (Scottish Citylink) Group in December 1995. Originally operating out of the Brecklet Garage before moving into the West Quarry, they had been running buses around the Ballachulish area since at least the 1930s.However, sadly the new owners did not sustain the business name and Gaelic Buses disappeared from local roads in 1997. The old Gaelic Bus depot in the West Quarry is now the home of Lochside Garage, who moved from a garage in North Ballachulish, and also the Highland Council. The creation of the Scottish Parliament meant that responsibility for the roads and bridges in Scotland passed from the Scottish Office to the new Scottish Government, and so Ballachulish Bridge is now maintained on behalf of Transport Scotland, the Scottish Government Transport Department.